creative savv: Found any rocks lately? 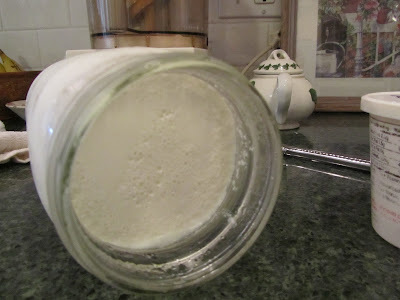 I have this funny picture in my mind of a geologist, somewhere, googling rocks, seeing the title to my post, coming to my blog, and scratching his head over why a geology site would have scores of posts on cooking, sewing and crafts. 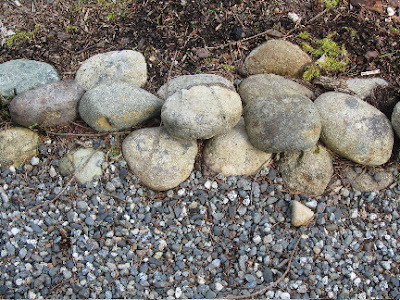 Anyway, I guess I should have given this post a nicer title, like "How we use found rocks decoratively and functionally in our landscape". A neighbor of ours did a bit of research on the geology of our area. What he discovered was the soil here is littered with rocks due to a massive glacier cascade, a very long time ago. This is very good news for the stability of our home's foundation. 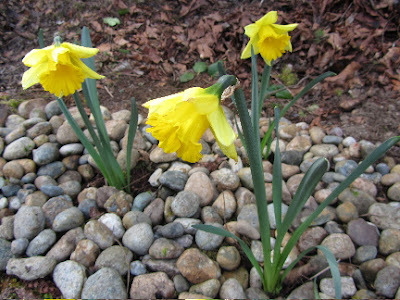 But when it comes to planting, the rocks present a few problems. Every time I dig even a 1-foot deep hole, I am faced with extracting a bunch of rocks. They can be as small as a pebble, or as large as 2 feet in diameter. 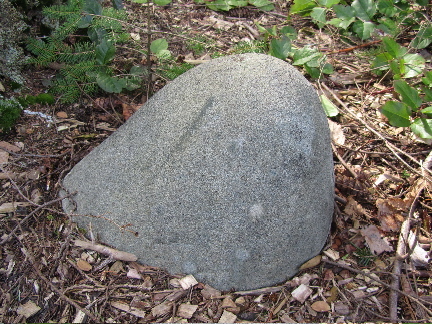 Over the years, we have set aside these rocks, in a designated spot in the yard, to use later in the landscape. The very large rocks we use for their sculptural value, placing here and there, but sometimes just getting them out of the soil and leaving them right in that spot. Here's one that must weigh 100 lbs at least. I can't get it to budge. So it's been left right here, at the edge of a walking path. 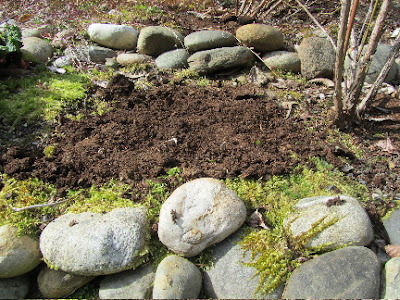 The large rocks (less than a foot in diameter, but larger than 6 inches in diameter), I have used to build low retaining walls, for terracing, such as in this area on a slope. The narrow bed it created is now planted with a dwarf boxwood hedge. The medium-sized rocks (less than 6 inches, greater than 4 inches) I use for two purposes, in terracing, and in edging a gravel walking path out to the woods. For the terracing, here, I stack 3 rocks for a shallow terrace, for the area that drops down from the lawn to the small, lower pond. I usually have to touch-up this one each spring, as freezing and heaving cause some movement of the stones. 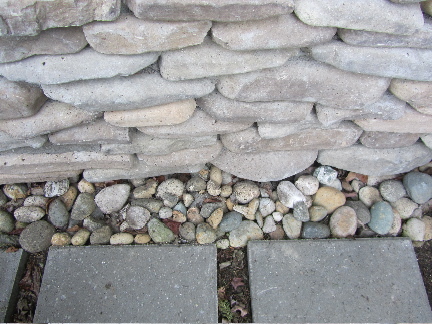 For the walkway edging, I place 2 rocks side by side, then top with a third rock. The purpose here is to keep the gravel from being scattered outside the path, by us as we walk to and from the woods. I don't have a photo, but I also use this size rock to mark where invasives, such as oxalis and ivy, are not allowed to cross. I simply lay them in a line, within a bed -- one side of the line for invasives, the other for more favored plants. Anyone in the family can come out, and know where to pull the ivy or oxalis that has crossed the line, keeping my perennials safe from an invasion. The small rocks (what I think of as river rock sized) are what I use under trees, as ground cover, and at the base of daffodils. 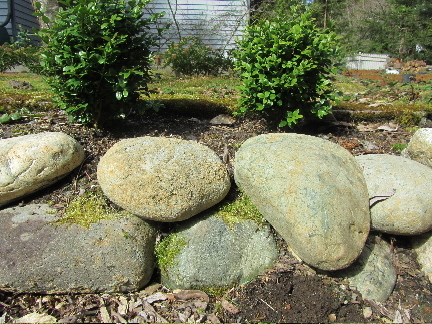 The river rock prevents many weeds from taking hold as seeds are scattered, and they form a nice ground cover under trees where lack of sunlight and competition for water & nutrients from the tree overhead, might prevent good growth of grass. These small rocks are also the ideal size for placing at the base of the stone front to our kitchen, between a paver path and stone exterior wall. Again, as a weed barrier in a spot I don't wish to be constantly patrolling for weeds. The tiniest of rocks, more like pebbles, I use decoratively along the walkway down to a pond in the sunken garden. We've laid bluestone steps in the center here. 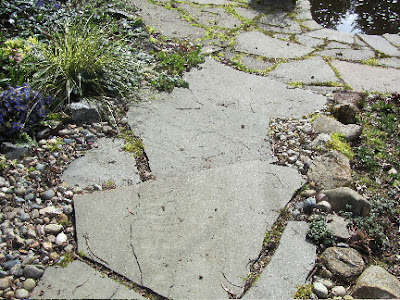 The tiny stones, along with sandy soil underneath, make a good medium for succulents, like hen and chicks, to edge this walk, and minimize weeding for me. I was moving some daylilies yesterday from their cramped quarters, to a more spacious area. 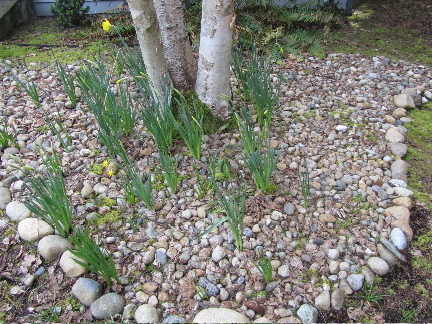 I'm thinking of laying small "river" rock at their base, as I do with the daffodils. I like the look of the flowers in a dry river bed of rocks. One step at a time, though. Developing our yard is turning into quite a significant project. But I'm enjoying every step of the way! Is gardening your thing? Or is it something that you do because it needs to get done? I think it's a lot like rearranging furniture. I get an idea that I'd like to move this over here, and that over there. Fortunately, moving plants is a lot easier than moving sofas! That's interesting. We have no rocks like yours - just lots of clay. I like gardening but it's often the thing that drops off the bottom of the list. Also we're still waiting for the weather to warm up for it to be a pleasant activity! Now I would have thought that most of England would have rocky soil, and not clay. Because in photos of England, I always see these ancient stone farmhouses. I really need to travel more and see first hand what the world looks like, instead of relying on coffee table books! I'm hoping for a warm up for your part of the world, too. I know that anyone in the no. hemisphere, who is still seeing snow, is really weary of it! We have sand. Lots and lots of sand. In the houses by Lake Michigan the owners "sell" free sand every year (as you can imagine, it blows all over their lawns during the winter). It's a source of entertainment to read the signs--"free sand" "free-er sand" "really really free sand"--that dot the road. We always have lovely sand for our sandbox (it is a very fine, soft sand). I always think I should like gardening, but I get easily bored with it. Someday we will landscape our front yard. For now, I rely on multiple pots of flowers to cheer up the outside of my home. My hubby bought me 2 huge pots for my birthday a few years ago, with potting soil. Not a romantic gift, but I sure appreciated it. Yours looks so pretty! My crocuses are blooming and my daffodils are up (poking through the snow) but I'm not sure how they will fare in our continued chilly temps. That IS a romantic gift! He knew that you would enjoy filling them with flowers. When a spouse knows what the other would enjoy, I think that is romantic! Funny about "selling" free sand! That would be like me "selling" rocks here! Or rain water! But I'm sure very nice for the sandbox. I didn't realize that the Lake's edge was a sandy one. Sandy beaches are not so common here. See, I really need to travel more! Warm weather cannot be far off, it just can't, right? I'm hoping for a warm up for you soon! I didn't think about England having clay soil until Sarah commented on it, but on my one-and-only trip there, there were lots of pottery/porcelain places to go, so I guess it makes sense. That's pretty much what we harvest here in New England--rocks! Good ideas, Lili! I remember travelling to the East coast when I was younger and seeing drystack stone walls everywhere. I asked my parents about this (I grew in in So. Calif, so stone walls were a novelty to me) and they told me that the people there used what they had. In So. Calif, walls in front of homes were often stucco. Yes, I harvest more rocks than anything else in my garden! It is so funny how different people are. Trying to do that would be so tedious to me and yet I can sit and tat with sewing thread and never find that tedious. And it's a good thing, I think, that we all enjoy different things. What a boring world we would live in if we all enjoyed everything the same. You probably experience doing needle work, what I do in the garden -- time with my thoughts. I day dream my way through a project, then before I know it, I'm done, and I stand up and wonder how I got it all done without paying any attention to what I was doing! A wild garden is nice on the eyes, too. I love the look of river beds winding through a landscape and you have nice looking rocks to do it with. This reminds me of when we lived in the Gulf Coast and we had to buy any rocks when we wanted some as the area is just made of clay. When my kids would visit their grandparents their pockets would always be full of rocks and they would carry as many back in their suitcase as they could get away with. That's too funny about your kids "smuggling" rocks home! 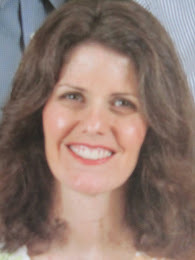 In the Little House books, 5 year old Laura couldn't resist the pretty rocks on the shore of the Lake, and filled her pocket until it tore a hole! I remember neighbors, when I was growing up in California, ordering (and paying for) rocks by the truckload to add to their landscapes. That's hard to imagine, now! I like the dry river bed look, too. And it's practical for me, as it suppresses weeds, so less weeding chores! I love looking at how you used the rocks you have unearthed. Our land here is filled with rocks and makes any digging very hard to accomplish. I began using the larger ones to circle an area with wildflowers last year and plan to change that up this year and add even more. I am going to save this post for some inspiration as I get out and start to work, hopefully soon. You're also northeast, right? A lot of rocks, I can imagine! The digging is hard work. But for many of the things I want to plant, it's vital. One of our neighbors gave up on digging the rocks out She built shallow (6 inches deep) rock retaining walls everywhere she wanted to plant, and filled with top soil. She has an amazing garden, the kind of thing that should be on garden tours. I should see if she'd let me put a few photos on my blog, because it really is beautiful. I hope you have a significant warm up soon, too! Too much snow for some parts this year! When we lived in Idaho a few years back we lived along the snake river. We incorporated rocks into our landscaping too. I love the way they look with flowers sprouting up. I see your vision and I am so enthused for you-I am anxiously waiting for more photos!! I would imagine Idaho would have a similar soil composition, with the addition of some volcanic rock, too. As I get the gardens cleaned up a bit (I work like a tornado, doing as much as possible, without thought to cleaning up, until I've got an entire spot planted), I'll take more photos and post them. Some areas of the property sill need a whole lot of work, and that will take many more years. But other areas are closer to being finished -- but there never is a finished landscape. A landscape is always midst changes, I think! Your Easter plans sound like a lovely day shaping up! I love the idea of fried chicken for Easter dinner! Oh, I love the rocks! Especially the first extra large rock. They can make a landscape look so nice. And you can do so much with them. Make raised garden beds or border your flower beds. I hope you have a wonderful Easter, Belinda! I love that phrase, "functional rock sorting system"! It makes what I do sound so official. But that is what it is. 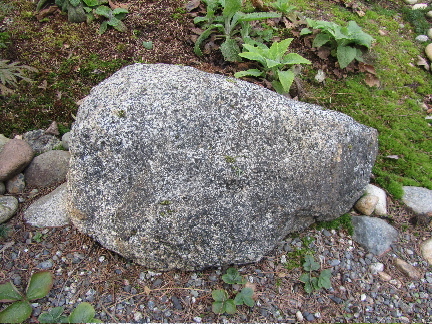 I have found that I notice other people's rock displays in their yards, now that I have focused some attention to my own. Have a lovely Easter! I hope you at least get sunshine, even if it is still winter, there! As a kid, I has a fascination with rocks. One year for Christmas, I begged and begged for a rock tumbler. And every vacation to a national park, we'd always go into the geology shops and I couldn't take my eyes off the the different rock displays. Even to this day, when I find a particularly pretty rock in the ground, I set it aside and find some way to use it in the house. My family teases me about my "emerald". I was certain that this green rock had to be an emerald, one summer. You hear of all those stories of people finding precious gem stones in their backyards. I just wanted it to be me sometime!